Guilded Age » Guest Week 2013 – Gustavo Duarte Yza! Guest Week 2013 – Gustavo Duarte Yza! 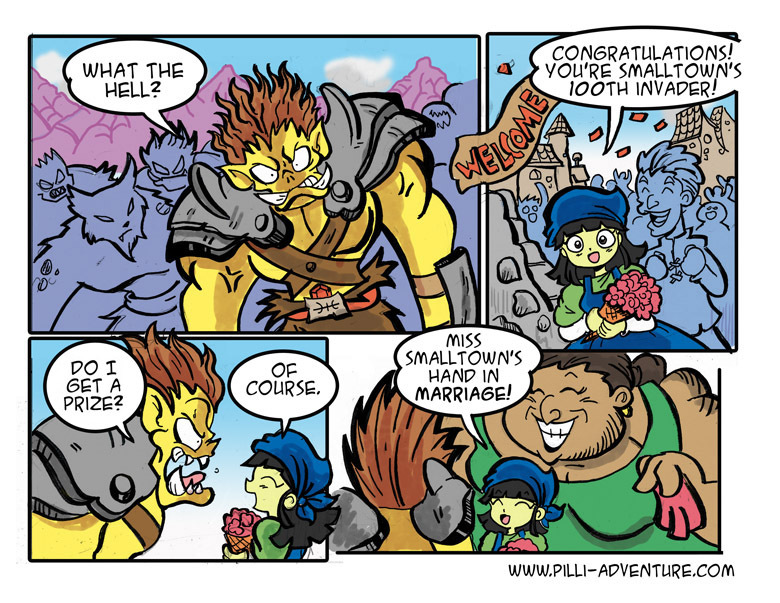 Today’s Guest Strip is lovingly crafted by fellow fantasy comicker Gustavo Duarte Yza of Pilli Adventure! I never thought I’d see the day where Big Boss Harky, Chieftan of the World’s Rebellion, slayer of humans, leader of disenfranchised races everywhere, would be so Gosh-darned adorable. Thanks, G.D.! They have devised the ultimate defense. That is the most adorable Bow I have ever seen. You could say he got..
Wow, my avatar looks nothing like me anymore. Wait, have the avatars changed again? I seem to recall them doing that on occasion. Nope, I’m still Rachel carrying the swag. Sorry for intruding, looks like it’s likely something with the custom avatar. Two trolls with one stone. And who knows? maybe he likes her. Pilli Adventure… got online again? Looks like I got quite the backlog, now. Nevermind, still offline (at least in Brazil, DownOrNot and similar sites say everything is fine there). Maybe it’s a DNS problem, even though switching it had no effect. ATM I’m in Paraguay and the site looks OK. Thanks for the attention, though. Little does he realize that the woman behind the greeter is not in fact the refered-to “Miss Smalltown” but simply her overly excited mother.